The port of Douala on the Atlantic Coast of Cameroon, Jan. 10, 2018, is the nearest seaport for Chad and the Central African Republic. 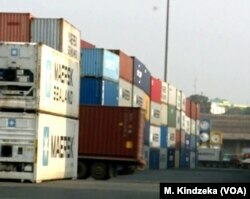 Landlocked Chad and the Central African Republic have dispatched senior customs officials to Cameroon to look into allegations of corruption in the Atlantic Coast port of Douala. Shipping containers are stacked up, Jan. 10, 2019, at the port of Douala, Cameroon. “When you arrive at the port and at any checkpoint, from gendarmes to police to customs, you have to pay money, you have to pay heavy money, you do not know why you pay but you must pay before you pass,” Vokeng said. “Whether you enter with empty trucks or you are loaded, you have to pay. When we load we have to wait for the tracking equipment from the customs to be certain and when it is certain we have six hours to leave the seaport to Yassa, which is the first checkpoint. When you arrive at the checkpoint after six hours you have penalties to pay,” he added. Cameroon gendarmes in Bertoua, east Cameroon, control vehicles on the way to the Central African Republic, Jan. 5, 2019. 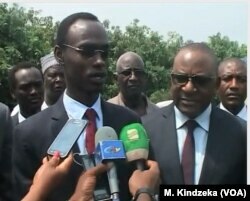 “We are systematically controlling all vehicles to CAR and Chad because of insecurity and the crisis in CAR. We have to do it for their own security and safety,” Ngube says. Director general of Chad’s customs, Colonel Ousmane Adam Dicki, visited Cameroon, Jan 10, 2018.